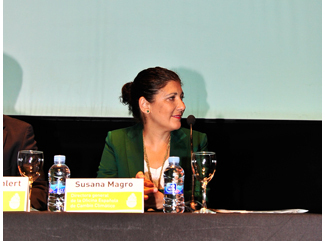 Susana Magro, general director of the Spanish Office for Climate Change, said in her speech as a speaker at Humana Day Madrid that "recycling is fundamental. Whenever you recycle, every time we make a proper waste treatment, from my point of view, to the Spanish Office of Climate Change, he comes in handy. Because you are saving emissions." During her presentation, the general director referred to the report of the IPCC, the Intergovernmental Panel on UN Scientists on Climate Change, which has just been introduced in Stockholm. "This report is positive because it has cleared all doubts. If there was any critical voice, the report has given us a series of absolute certainties. The report says as concrete data that climate change is produced with 95 % certainty , by human activity. " It is time to act in an even more decided way, therefore. "This year is effective in the EU new legislation, the 'climate change and energy package', which means that, by 2020, we must be able to reduce our emissions by 20 %. But also accompany him to achieve 20 % energy efficiency and reach a 20 % renewable energy". Another challenge is to involve a greater number of international players, "This commitment by the EU to reduce its emissions have joined Australia , Switzerland ... three or four more countries ... But overall we are a 18 % of countries in the world. While big do not move, and when I speak of the great U.S., China, and India, which is one of the major emitters despite being a country still developing, because that challenge will be complicated." Last year, "we got in Qatar that all countries, 198, which in 2015 agreed in Paris will sign a new agreement that will not be the Kyoto Protocol to reduce emissions, but it will be another, not know yet how it will be called, and will be legally binding on all. Each within their capabilities." Magro he congratulated the winners, highlighting its partnership with Humana in the field of textile recycling. 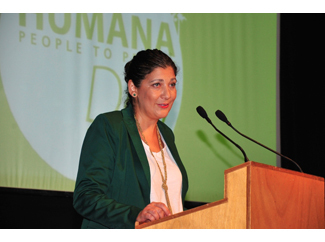 The director, also, was very grateful for the organization of events such as the Humana Day: "It is very significant and very important because it supports the work we do, sometimes very unknown, from the Ministry, from the Spanish Office for Climate Change".